Undoubtedly the most talked about build of the year, Sailing Yacht A has garnered much attention for her unique form, massive size and well-known owner. Built for Russian yacht owner Andrey Melnichenko, the boundary pushing Sailing Yacht A is a natural head turner. 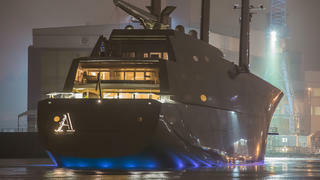 Her build at German yard Nobiskrug has been stalked by yacht geeks and mainstream media alike, and the constant coverage has produced some amazing photos. Now that the yacht has been delivered, we take a look at the best photos of Sailing Yacht A.
Pictured in January 2017, shortly before her delivery, Sailing Yacht A is seen here illuminating the waters around the Nobiskrug yard with her underwater lighting. This stunning photo also shows her light-up nameplate, which matches the style of the nameplate on Melnichenko's Motor Yacht A. One of the best photos of Sailing Yacht A was shot back in 2015 as she headed out for her first set of sea trials. 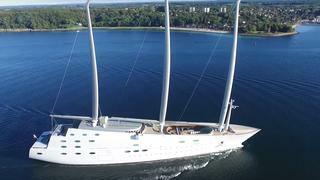 While Sailing Yacht A's owner Andrey Melnichenko calls her a "sail-assisted motor yacht", she is regarded by many to become the world's largest sailing yacht. Her formidable size of 142.81 metres LOA — and generous volume — is unmistakable in this photo, as she completely dwarfs the seaside town. The smaller yachts in the harbour and houses dotted along the shoreline look like mere toys compared to the imposing Sailing Yacht A. Another one of the best photos of Sailing Yacht A, this snap shows the contrast between her cutting-edge technology and design and the old world, as she provides a stark contrast to the traditional clipper Amsterdam Stad. The classic yacht is in the foreground, while the modern wonder that is Sailing Yacht A rides up behind, ready to pass the clipper, both literally and figuratively. They say a picture speaks a thousand words, and this one that highlights the huge differences between a beautiful classic sailing yacht and the ultra-modern Sailing Yacht A certainly says plenty. 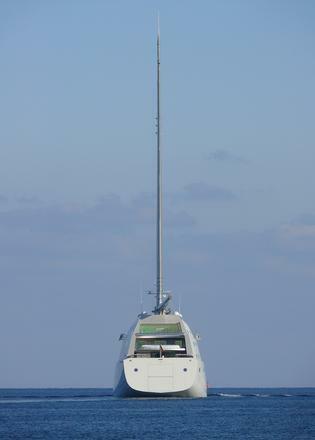 This photo of Sailing Yacht A gives a close-up view of the yacht's bridge and wingstation, perched atop the superstructure. 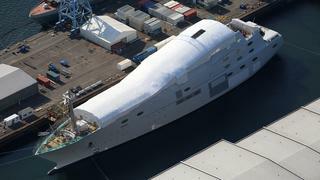 This photo illustrates just how big this yacht really is. Peer closely and see how tiny the captain looks up in the bridge. The human form gives a good sense of scale as to how large the yacht is around him, how huge the oval portlights are below, and how gigantic the yacht's booms and rigging are above. Sailing Yacht A has the tallest carbon masts in the world, in fact. 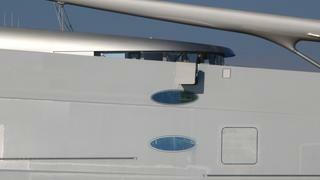 This photo of Sailing Yacht A gives a view of a parts of the yacht that was previously unseen — the aft deck. Much like Andrey Melnichenko's Motor Yacht A, the yacht looks as though there isn't much outdoor space, but seen from behind in this video of Motor Yacht A, the preconceived notion changes. The same can be said for her sailing counterpart. You can see that there are layers of decks that enjoy outdoor space, and the top deck is glassed in, giving a view to the indoor-outdoor lifestyle that might be enjoyed on Sailing Yacht A. 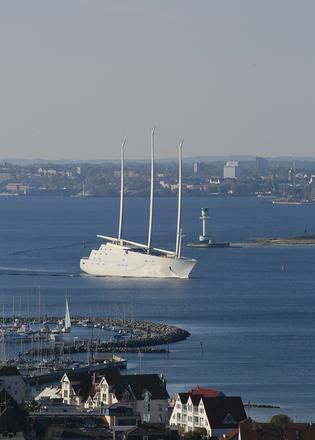 One of the best photos of Sailing Yacht A to arise when she went out on sea trials was this shot taken from a drone video. From this angle, we get a great view of the foredeck of Sailing Yacht A and the outdoor living spaces here, which hadn't been seen before. It was big news when the masts were stepped on Sailing Yacht A and we got to see what this formidable vessel would look like for the first time. It also made for one of the best photos of Sailing Yacht A to finally see the giant masts get stepped atop the giant yacht. 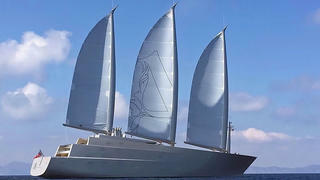 Dykstra Naval Architects designed the rig on the three-masted yacht, while Philippe Starck, who also designed Steve Jobs' Venus, worked on the yacht's design. Another milestone was the day Sailing Yacht A was launched. While she was still covered up in this aerial view, it was still a treat to those who had been following her build to get a glimpse of her hull shape and imagine what might lie beneath. Sailing Yacht A's accommodation is spread out over eight decks, and she has a beam of 24.88 metres. She can accommodate 54 crew to take care of this sizeable vessel, which includes amenities such as a touch-and-go helipad. 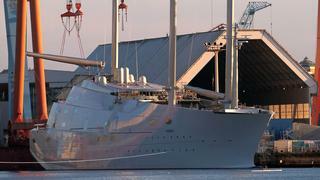 Sailing Yacht A boasts the tallest carbon masts in the world, each measuring in at more than 90 metres long. 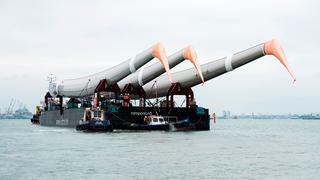 The masts were built by Magma Structures in Portsmouth, UK, and this photo shows the masts being delivered to their home on board the new superyacht. 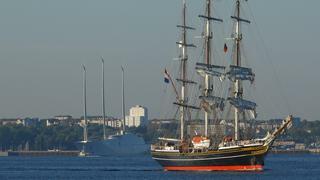 The masts will host sails that are larger than a football field.